Knitted dolls, toys and stuffed animals can be a lot of fun to make. But make no mistake, these patterns can be complicated, requiring frequent color changes and a lot of attention to detail. 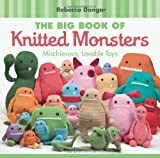 Most knitted doll and stuffed animal patterns will require seaming and stuffing after the knittng is over. But all the effort will ultimately pay off and you'll have a unique knitted creation to keep for yourself or charm a special child in your life. Beginner. These crochet finger puppets with removable accessories are quick to make and fun to play with! Intermediate. A cute colourful parrot that will be a child's best friend. Beginner. Catch is a corrugated rib hacky sack (knit a few and they're juggling balls). Beginner. A baby sized football for sports fan parents and their little quarterbacks. Gauge: 5.5 stitches per inch or 22.0 stitches per 4 inches. Gauge: 4.0 stitches per inch or 16.0 stitches per 4 inches.